Clifton & Mauney is dedicated to being your choice when you’re looking for a pediatric dentist or orthodontist in the Chapel Hill, Durham and Hillsborough, NC areas. We strive to provide the highest quality of dental and orthodontic care so that all our patients can leave our Chapel Hill office with a healthy smile. There’s no better way to build and maintain a great smile than by consistently brushing and flossing. However, when a person has braces, it requires a little more care than usual to brush and floss properly. Here are some brushing and flossing tips to use for a patient undergoing orthodontic treatment. First, you’ll want to use a soft-bristle brush and apply fluoride toothpaste to it. Start your brushing with the outsides of your teeth; gently use small circular motions to polish them clean. For the areas between your gums and braces, tilt the brush toward the gum line while continuing with your circular motions. After you’re done, move onto the chewing surfaces of your upper and lower teeth, making sure to use a firm back-and-forth method to clean them. Lastly, finish up by brushing the insides of your teeth using the same technique that you did to clean the outsides of your teeth. You should brush at least twice a day, each time lasting about two minutes. 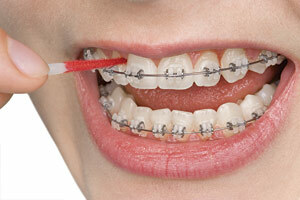 Be especially careful to clean the areas between the wires and your teeth and also between the brackets and your gums. These are the areas where food is most likely to be trapped. proxabrush. The proxabrush has a small tuft of bristles that stick up all around it, much like a pipe cleaner. By using it carefully, you can clean the tiny spaces under wires and around bands and brackets. Another helpful tool for cleaning is the oral irrigator or ‘water pick.’ This device can remove food particles that get stuck in your teeth by shooting out a small stream of pressurized water. While it’s not a substitute for brushing and flossing, the oral irrigator can be very effective when used along with those techniques. First, you pull one end of floss through the floss threader. Push the threader while it’s carrying the free end of the floss underneath the archwire. Next, grasp the floss on both ends and slide it up and down the sides of both teeth and all the way under the gums. You should continue until you hear a squeaking sound. Finally, pull out the floss and use a new section of it for the next area of your teeth. If you’re ever curious to wonder how well you did in cleaning your teeth, there’s actually a way to find out. You can use special vegetable dyes that are called ‘disclosing solutions’ or ‘disclosing tablets.’ As these dyes dissolve in your mouth, they’ll highlight the plaque and food debris in your mouth that your brushing happened to miss. These dyed spots are easy to brush away and they’ll let you know what areas you need to brush up on. Contact Your Chapel Hill and Durham Orthodontist Today! If you’re interested in scheduling an appointment with us, feel free to fill out our online appointment request form or give us a call. Our phone number is (919) 933-1007. If you have any questions, please don’t hesitate to contact us online or by phone. We look forward to putting you on the path toward a healthier and straighter smile!